I love D. to bits, but I cherish time to myself. Hey, I think it's healthy. He's working this Saturday and when I have time to myself, I do one thing: eat all the things he doesn't like. Hehe. 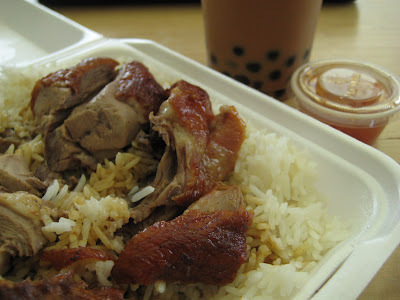 My favorite is BBQ duck on rice from Sam Woo. Sam Woo is like the In-N-Out of Cantonese cuisine. It's cheap, it's basic, and it's very satisfying. The service at In-N-Out is much better, though. 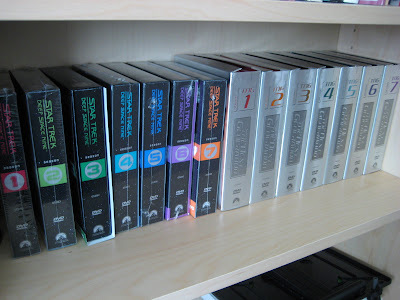 Yes... that's 7 seasons of both Star Trek: The Next Generation and Star Trek: Deep Space Nine. D. knows what I like. The TNG set was a Christmas gift from three Christmases ago and DS9 is an early birthday gift. Amazon had a sci-fi sale. I have Star Trek marathons when D.'s away working or traveling, because as much as he loves me and he likes Star Trek, he'd go nuts watching it for hours on end. I, on the other hand, love it. I love it! What a great afternoon. I'm the same way when Paul is gone. I indulge in things I know he wouldn't eat: salad rolls and bun. Also I loves me some good Star Trek. If you haven't already, you should go to Quark's Bar in Las Vegas. Hi GF - The service is much better at In-N-Out...a bit of an understatement! Sam Woo's BBQ is wildly inconsistant(and not nearly as good as the SWBBQ in LA), though you can't beat the prices. Darlene- With the weather we've been having, bun sounds awfully good. I've been to the Star Trek Experience, but we didn't eat anything at Quark's. 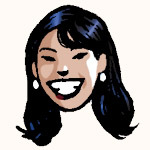 Kirk- Yeah, the Sam Woo here is a poor facsimile of the LA branch, but it'll have to do. ;) The prices are outrageously good, esp. at their take out counter... the two item combo was $4 and it was enough food for two meals!